Do You See Pigs Flying? I’m pretty sure I see them. I’m also pretty sure the heavens have opened and I can hear angles singing. Indeed, there is big news in my house this morning. I honestly did not see this coming. I was pretty sure I would never see this happen. Of course, I could add in there this bit about God being good and the Bible actually being right, but I’m going to assume you know those are givens, so I won’t. Are you sitting down? Please, go ahead. I’ll wait. There. Are you in your chair yet? Good. You might also want to get your Polident ready for cleaning your teeth after you get them up off the ground. I first stumbled across the news while poking around yesterday. The headline that grabbed my attention was this: Harold Camping Admits He Was Wrong About End Of World Prediction. I’m pretty sure that had you been sitting next to me, you would have heard my audible gasp. If you haven’t been reading along, I’d suggest you start here: Waiting For The Rapture. Once you’re done with that, read this: I’m Still Here. Still, this stuck me with, and I thought about this for a while……………Post Non-Rapture Ponderings. Unfortunately, I was remiss in not writing about the non-end of the world in October, 2011. I assume there must have been something else really important going on that got me sidetracked, but for the life of me, I can’t remember what it was………. Now that you’re all caught up, you can see why Harold Camping’s apology is so important, can’t you? In fact, I am SO stuck by this, that I’m sharing his letter below, as posted on the Family Radio website. THE BOARD OF FAMILY RADIO WISHES TO POST THE FOLLOWING LETTER FROM MR. CAMPING. IT WAS OUR WISH, OUT OF RESPECT FOR OUR LISTENERS, TO MAIL OUT THIS LETTER BEFORE POSTING IT TO THE WEB SITE. HOWEVER, BECAUSE IT WAS LEAKED TO THE INTERNET WITHOUT OUR AUTHORIZATION, WE HAVE MADE THE DECISION TO POST IT IMMEDIATELY TO AVOID CONFUSION. THIS LETTER WILL ALSO BE MAILED OUT TO OUR LISTENERS. In this time of confusion and turmoil, God’s Word remains the only truth in which we can trust. God has shown us again the truth that He alone is true. In Romans 3:4 God declares: “Let God be true but every man a liar.” Events within the last year have proven that no man can be fully trusted. Even the most sincere and zealous of us can be mistaken. The May 21 campaign was an astounding event if you think about its impact upon this world. There is no question that millions, if not billions of people heard for the first time the Bible’s warning that Jesus Christ will return. Huge portions of this world that had never read or seen a Bible heard the message the Christ Jesus is coming to rapture His people and destroy this natural world. Yes, we humbly acknowledge we were wrong about the timing; yet though we were wrong God is still using the May 21 warning in a very mighty way. In the months following May 21 the Bible has, in some ways, come out from under the shadows and is now being discussed by all kinds of people who never before paid any attention to the Bible. We learn about this, for example, by the recent National Geographic articles concerning the King James Bible and the Apostles. Reading about and even discussing about the Bible can never be a bad thing, even if the Bible’s authenticity is questioned or ridiculed. The world’s attention has been called to the Bible. We must also openly acknowledge that we have no new evidence pointing to another date for the end of the world. Though many dates are circulating, Family Radio has no interest in even considering another date. God has humbled us through the events of May 21, to continue to even more fervently search the Scriptures (the Bible), not to find dates, but to be more faithful in our understanding. We have learned the very painful lesson that all of creation is in God’s hands and He will end time in His time, not ours! We humbly recognize that God may not tell His people the date when Christ will return, any more than He tells anyone the date they will die physically. We realize that many people are hoping they will know the date of Christ’s return. In fact for a time Family Radio fell into that kind of thinking. But we now realize that those people who were calling our attention to the Bible’s statement that “of that day and hour knoweth no man” (Matthew 24:36 & Mark 13:32), were right in their understanding of those verses and Family Radio was wrong. Whether God will ever give us any indication of the date of His return is hidden in God’s divine plan. We were even so bold as to insist that the Bible guaranteed that Christ would return on May 21 and that the true believers would be raptured. Yet this incorrect and sinful statement allowed God to get the attention of a great many people who otherwise would not have paid attention. Even as God used sinful Balaam to accomplish His purposes, so He used our sin to accomplish His purpose of making the whole world acquainted with the Bible. However, even so, that does not excuse us. We tremble before God as we humbly ask Him for forgiveness for making that sinful statement. We are so thankful that God is so loving that He will forgive even this sin. So we must be satisfied to humbly wait upon God, and trust He will guide His people to safety. At Family Radio, we continue to look to God for guidance. If it is His good pleasure for us to continue on with our original mission, the proclamation of the Gospel, God’s Word, then we must continue to look to Him. We consider you to be a real part of this ministry and the tremendous opportunities which God, by His unfathomable mercy and grace, continues to give to us. And, your steadfast involvement and support is so appreciated! May God bless you, Harold Camping and the staff of Family Radio. And that, my friends, is why I was gasping out loud. He admits he was wrong. He admits his sin. I’m not sure that statement actually reflects humility. I’ll have to think about that some more. I’d really, really like to think that he genuinely repents and truly sees his wrong-doing. Sometimes, the best apology is a simple two sentences. I’d feel a lot better if he’d just said, “I’m sorry. I was wrong.” And left it at that. Then in a later missive, give some the other stuff. But, imo, an apology coupled with justification of why the wrong-doing happened doesn’t sit well with me. That he compares himself to “other great men of faith” like Abraham (in his audio message from 11/8/11)? Nope, I’m not even gonna go there. Yep. I’m gonna have to do that, because the more I think about it, the more I feel like the apology wasn’t sincere as it should have been. I’m gonna think that maybe the second part of the statement negates the apology and promotes what happened as being a mighty event and demonstration of God’s work (which of course, it may well have been, but it’s not humility that goes around tooting its own horn) and I just really want to accept the apology as being sincere…..
Harold Camping predicted the end of the world three times. He failed each time. That he has no intention of entertaining new dates- that’s a victory. His followers spawned websites (see Waiting For The Rapture). Many of them quit their jobs and sold all their belongings. I wondered how they felt after the invisible rapture. And then again after the world didn’t end in October. I wonder if they are as critical and as wary of the apology as I am. I wonder if their faith in God has been shattered and left them not wanting any part of Him. I wonder if Harold Camping has REALLY repented his sin, because that, too, is pretty darn important. And, I wonder if I should move on from this debacle, and just focus on Preparing for Zombies…….. I assume that you are, too. You do remember what Friday was, right? 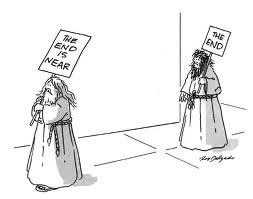 Harold Camping, of Family Radio, had again predicted the rapture and the end of the world. This time, the rapture was going to happen on May 21, 2011. This is when, Camping said, all the Christians would be taken up into heaven while the rest of the world waited for the end of the world on October 21, 2011. Ya got that? The rapture did happen, but it was invisible. I am not sure how they will explain the “annihilated together with the whole physical world on October 21, 2011″ bit, but I am sure that an answer is forthcoming. The Huffington Post tried to get a comment, but was turned down. Out of all of this, I wonder what has happened in the months since those folks quit their jobs and gave up their life savings. I wonder how they are making out; what their perspective is these days. At any rate, I’m still here, and I assume you are, too. 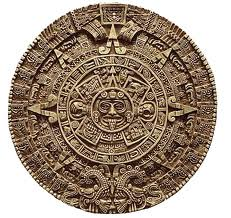 I think the next logical step is to be relieved that we still have a year + to think about the Mayan calendar, which ends December 21, 2012. I wonder if the Mayans predicted their own cultural demise as well…..
Or maybe we should spend our time worrying wondering when the Yellowstone Caldera super volcano is going to blow, given the earthquakes, etc. Are animals really leaving Yellowstone? In February 2011, 400 buffalo that migrated from Yellowstone in search of food were corralled and slated for slaughter. The Buffalo Field Campaign has more information on its work to stop the slaughter of Yellowstone’s wild free roaming buffalo. This whole thing just stinks to me (and breaks my heart); messing with natural migration and habitat because we are encroaching on their environment. But hey- we won’t need to worry about the buffalo (or anything else) when the solar flares hit and take out the world’s nuclear power plants. I guess instead of worrying, I should get back to preparing for zombies. And you should too. This is an absolute must read. After all, you know it’s serious business when the CDC puts out a warning! Make sure, though, you have a copy of The Top Ten Signs That You Might Be A Zombie so you can learn if you or your friends have already succumbed to zombification. Leave me a comment and let me know what other ways the world is going to end so I can start worrying preparing for them, too! I like to plan. I like to make my outlines (including notes) so that I am sufficiently organized to move forward. Once I know what I’m doing, the written stuff can go by the wayside, as I learn what is working and what isn’t, and start tweaking, or de-bugging, as it were. My critical thinking skills are in near constant use. Some plans take a bit longer to flesh out and implement, like getting chickens, for example (Do I really want to do it? What will it mean for taking vacations? Do I really want more animals?). Other plans are more straight forward; supplies are obtained and the plan is put into motion. These are the kinds of things I prefer- the ones that make good logical sense (or do not) after doing research. I’m always gathering information, and adjusting my opinion accordingly. This doesn’t mean I’m an expert on stuff; just someone capable of researching and applying critical thinking. The one area of my life where this M.O. isn’t based on that process is my faith. Faith is its own entity within my life, and I have had plenty of actual experiences (working in hospice; dealing with and being there when people passed, etc) to know solidly where I stand on this topic overall. One area of the Bible – or perhaps it’s a subscription to thought- that I have not extensively studied is Revelation and the End Times. I think on some level, it’s overwhelming, since there is so much stuff to wade through. To begin with, there is not agreement of the End Times, nor how things will unfold. This page of Now The End Begins does a pretty good job, I think, of demonstrating the 4 main schools of thought on the Rapture. This topic can be confusing, since conflicting beliefs are all over out there. Last Saturday, I was sitting here, at my computer, cruising Facebook, when I saw the comment. You know the one, right? That comment about whether or not to do “x” because, after all, the world was ending May 21, 2011? And then someone posted a link. I ♥♥♥ links. 😆 They feed my desire to read. So I clicked, and away I went. That link went to the We Can Know website. This is just one of many sites that are based on the teachings of Harold Camping. But let’s back up the bus a little and get a little history. We all know that from the dawn of Christianity, there have been those (including Paul, although there is debate on his teachings as well) that believed and actively proclaimed that Jesus was coming soon. Anyhow, the followers of William Miller were called Millerites. They believed that the second coming of Christ was going to happen soon. At some point, a date based on the Karaite Jewish calendar was given to this event. That date was October 22, 1844, and was preached on by Millerite Samuel S. Snow. Obviously, the anticipated event didn’t happen. As a result, a new name was given to it: The Great Disappointment. What’s interesting, though, is that there were religious groups that were born based on theses beliefs, and some of them are still around today. Harold Camping founded Family Radio, and has $117 *million* dollar radio network has predicted that Judgement Day is today, May 21, 2011. This is not the end of the world. No, that will happen on October 21, 2011. *That’s* the day when, according to this website based on Camping’s teachings, God will destroy the earth. Since I am still sitting here, and I wonder if I need to get back to the post-Rapture checklist. Although, since Harold Camping originally predicted September 6, 1994 as being “The Day,” one has to wonder. In fact, he wrote a whole book about it, titled (wait for it……) “1994?”. As seriously as Camping takes his predictions – after all, his $117 million radio station is all around the world and translated into 84 languages – there are others who are equally passionate about questioning him and his teachings. One of the better sites I’ve found is an entire site (as opposed to a blog post or two) refuting his teachings. This page of the Refute Camping website deals with just the timeline of his predictions. The home page of the site explains its goal: “The purpose of this site is to diligently search the scriptures, like the Bereans, and to compare the teachings of Harold Camping and Family Radio with scripture, the bible.” While it continues to be a work in progress, I’ll be interested to see what – if anything – more happens with the site, now that “the day” has nearly passed. I think it’s safe to say that there will be others who predict “the end” and fail just the same. In the meantime, I’m going to keep reading and thinking. Here are some links to things I’ve stumbled across that I thought were interesting. Feel free to comment and share your links with me!